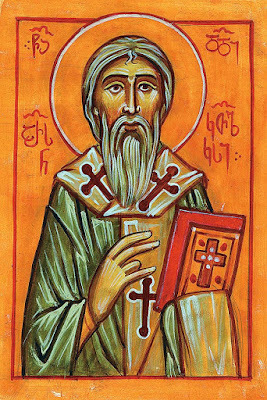 Saint Arsenius the Great, a pupil and spiritual son of Gregory of Khandzta, was the youngest son of a certain aristocrat, Mirian, from Meskheti in southern Georgia. On their way to Abkhazeti, Saint Gregory’s companions Theodore and Christopher stopped in Meskheti at the home of Arsenius’ family. Mirian and his wife, Kravaia, asked the monks to bless their children and, astonished at the fathers’ virtue, they entrusted their youngest son to their care. Gregory of Khandzta later traveled to Abkhazeti to visit Theodore and Christopher, and on his way back to the monastery he brought with him the young Arsenius, the future catholicos of Georgia, and the youth Ephraim, the future wonderworker and bishop of Atsquri. The monks Theodore and Christopher journeyed with them as well. The monks of Khandzta met the young men with grave displeasure, since the rules of the monastery forbade the presence of youths, but Saint Gregory assured the brothers that this was an exceptional circumstance in which God’s holy will would soon be revealed. Saint Gregory entrusted the young men’s upbringing to his companions and disciples, the hermits Theodore and Christopher. When Arsenius had reached the appropriate age, his father Mirian bypassed the Holy Synod and had his son enthroned as catholicos of all Georgia by his own initiative (he was helped by a small group of bishops and laymen). Mirian’s interference in the affairs of the hierarchy was a blatant offense to the Church and the faithful. A Church synod assembled in Javakheti to decide on a way to address Mirian’s behavior. The circumstances were particularly difficult, since the leader of the synod, Bishop Ephraim of Atsquri, had grown up with Saint Arsenius. But canon law upheld the judgment of the Church and the faithful, and it was decided to ask Arsenius to resign as catholicos. At that very moment, however, Saint Gregory arrived at the meeting and assured the holy fathers that Arsenius’s enthronement was a fulfillment of God’s holy will. The disturbance was soon calmed and the love between Ephraim and Arsenius restored, and the catholicos blessed the old church at Khandzta. With his God-pleasing example and divine love Saint Arsenius enlightened the Georgian Church and the faithful until his final day on earth. Saint Arsenius is also commemorated as a great historian and philologist. He is credited with the remarkable historical work On the Division of the Georgian and Armenian Churches. In this exposition Saint Arsenius logically proved that the Georgian Church had followed the path of true Christianity steadfastly throughout history, while the Armenian Church had strayed from the true path when it accepted the Monophysite heresy. To his pen also belong many remarkable hymns and lives of Saints. His work The Life and Martyrdom of Abibos of Nekresi is particularly worthy of note. Catholicos Arsenius the Great is known also as an active builder of churches. He constructed the Cathedral of Tkobi-Erda in the region of Ingushetia (near present-day Chechnya), in the Assa River Valley. Saint Arsenius led the flock of the Georgian faithful for twenty-seven years and joyfully appeared before Christ in the year 887.